Confessions of a Fangirl: The Hunger Games Trailer- Take Two!! AAAAAAAAAAAAAHHHHHHHHHHHHHH!!! Isn't it fantastic?!?!? Go ahead, watch it again, I'll wait. The Mockingjay pin- I wasn't sure how they were going to work it into the story since they didn't put Madge Undersee in the script. I like that they are having Katniss give it to Prim as a good luck charm who I'm sure will give it back to Katniss when she says goodbye after the reaping. Donald Sutherland is the PERFECT President Snow!!! Two lines in the trailer and I was completely creeped out. I can't wait to see more! Effie's enthusiasm about President Snow's comments perfectly embodies the Capitol spirit. It's creepy. Once again, the desperation in that moment that Katniss volunteers as tribute kills me. I've seen it multiple times since it was in the first trailer but seeing it again brought me to tears. Katniss begging Gale to take care of her mom and sister breaks my heart. Katniss in her yellow dress. That is the outfit she wears at the end of the games. It's not as subtle of a yellow as I imagined but it's beautiful. The expression on Katniss's face shows a changed person. I adore Stanley Tucci. He is brilliant in everything that he does. The brief glimpse we get of him as Cesar Flickman tells me I am going to love him even more. There's only a few quick new shots of Peeta but he is my boy with the bread in the ones we've seen before and in the new ones. 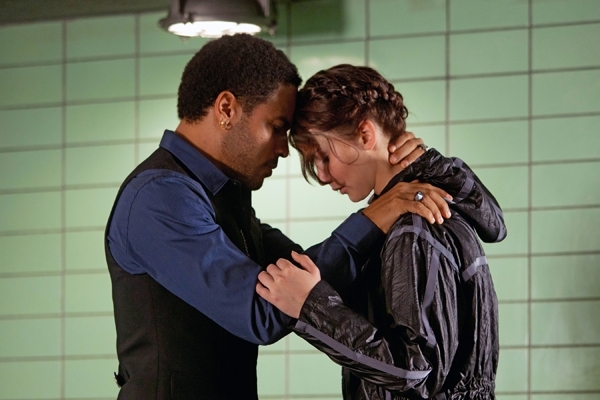 My sweet Cinna- I have been so worried about the portrayal of Cinna. I wrote an entire blog post about how worried I have been about it. Between the movie still from yesterday (see below) and the beautiful moment we see here in the trailer my fears have been put to rest. I have absolutely no doubt that Lenny is the perfect Cinna. That four note melody is going to haunt me forever. We didn't see Rue in this trailer but between the three finger salute and the music that is her whistle she was very present. I agree 100% with all you said. I still cry every time she says, "I volunteer as tribute. "Just thinking about it makes me tear up.